This programme will help broaden your understanding of the whole construction industry, but you’ll still be encouraged to specialise in brickwork, carpentry, and joinery or plastering. Training toward additional qualifications such as the Construction Skills Certification Scheme (CSCS), which proves that you have the required training and qualifications for the work you are carrying out on-site. You won’t get a job with a recognised company without one. Training for this additional qualification is offered at no cost to our apprentices (the fee for the exam and card application will still apply). You will also have the chance to work towards additional technical certificates. You can find out more information about becoming an apprentice or employing an apprentice by visiting our website. A site joiner for Wulvern Housing, the largest housing association in South Cheshire, Lucy is regularly out on site helping to maintain property. She enjoys the variety of her job, which can range from roofing and studding to hanging doors and fitting kitchens, and she also likes her day a week at college learning new tricks of the trade. Lucy gained a BTEC in Construction at school and followed this up with an apprenticeship with Cruden Construction before moving to Wulvern. She has worked her way up from Level 1 in Joinery at Reaseheath. 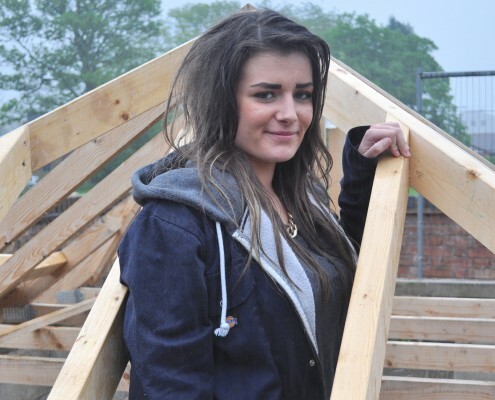 Lucy has always had good hand skills and has made the most of these at college by learning how to hang double doors and fit skirting, floor joists, stud partitions and kitchens. She’s also come to appreciate the use of maths because she has to measure her timber precisely.